Conquered by the Spanish in the 1500s, the ancient Mayan city of Xelaju was renamed Quetzaltenango and its history has remained firmly anchored in its Mayan roots since then. Guatemala's second city is prosperous and modern, yet its population is still made up mainly of indigenous Quiche Maya people. This gives the city, known for its coffee and agriculture, a lively indigenous atmosphere with Spanish colonial undertones. The area around modern-day Quetzaltenango was originally the homeland of the Mam Maya people, who ruled their kingdom of Kulaha from the site. However, the Maya in general were warring people and in the 14th century, the powerful Quiche Maya expanded their territory into the land of the Mam Maya, resulting in much conflict. The Quiche conquered the Maya and built a new city called Xelaju, at the foot of the Santa Maria Volcano. In 1524, the Spanish conquistador and Guatemalan governor Pedro de Alvarado y Contreras made his way to the Santa Maria Volcano with a large group of Central Mexican Indians, who were his allies. He fought the Quiche and killed their ruler Tecun Uman just outside of Xelaju. 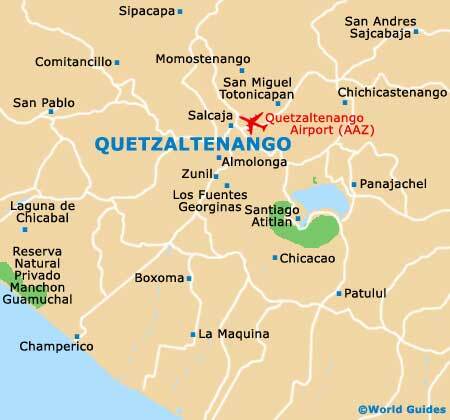 Alvarado renamed the town Quetzaltenango (The Land of the Quetzal Bird), which is what the Mexican Indians called it in their Nahuatl language. Quetzaltenango remained the city's name throughout the Spanish colonial era, although the indigenous Quiche locals who made up the majority of the population continued to call it Xela. Many Quiche still proudly consider Xela to be the capital of the Mayas, as their group was one of the most powerful kingdoms among the Maya. Following Guatemala's declaration of independence from Spain, the history of Quetzaltenango was boosted with the establishment of the state of Los Altos. This was one of the states within the new Federal Republic of Central America, and Quetzaltenango was its proud capital. This status only lasted until 1840, when the federation broke up amidst infighting. José Rafael Carrera Turcios, the leader of the Guatemalan army, conquered Quetzaltenango and made it part of Guatemala once again. In the late 1800s, coffee plantations arrived in the area and the city enjoyed a sustained period of prosperity. Much of the lovely Belle Epoque architecture still standing in the city was built during this coffee-boom era. An earthquake in 1902 caused the neighbouring Santa Maria Volcano to erupt, destroying parts of the city and much of the coffee-growing countryside. This natural disaster disrupted the economic boom being enjoyed by Quetzaltenango at the time, although the city soon regrouped and successfully rebounded. The geographic location of the city ensured that, in history, Quetzaltenango was always central to the regional activities of the day. As it lies at the intersection of ancient roads between Mexico, Guatemala City and the Pacific Slope, there has always been a steady flow of trade and travel through the area. Today, Quetzaltenango continues to bask in solid economic growth from its coffee industry, along with a newfound interest in the city as a tourist destination, thanks to its rich Quiche Maya atmosphere mixed with touches of Spanish colonial architecture.